Louise Noun’s final book was published in 2002 by the Iowa Women’s Archives in celebration of its tenth anniversary. The book was typeset by Eldon Meeks and Timothy Fay on a linotype machine using vintage typeface and printed at Route 3 Press (Anamosa, Iowa). It was hand-bound by Lawrence Yerkes (Iowa City). This limited run book is available from the Iowa Women’s Archives. 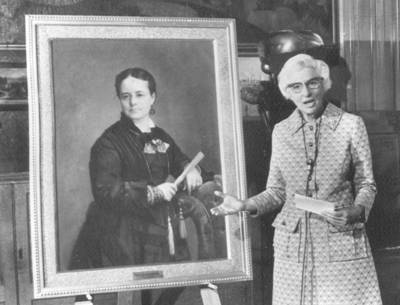 The “Strong-Minded Women Make History” logo honors Iowa Women’s Archives founder Louise Noun, who envisioned an archive of Iowa women’s history while researching her 1969 book Strong-Minded Women: The Emergence of the Woman-Suffrage Movement in Iowa. Since its founding in 1992, the Iowa Women’s Archives has preserved letters, photographs, writings, scrapbooks, and other materials that document the experiences of Iowa women, with particular emphasis on groups underrepresented in archives. The “Strong-Minded Women Make History” logo honors Iowa Women’s Archives founder Louise Noun, who envisioned an archive of Iowa women’s history while researching her 1969 book Strong-Minded Women: The Emergence of the Woman-Suffrage Movement in Iowa. Since its founding in 1992, the Iowa Women’s Archives has preserved letters, photographs, writings, scrapbooks, and other materials that document the experiences of Iowa women, with particular emphasis on groups underrepresented in archives. Researchers ranging from junior high students to international scholars visit the archives to use the collections. All are welcome; stop in for a visit!